When you think of a muffin you immediately get a picture of some sugary, flour bomb. Even in the paleo world, though refined sugar is swapped out for maple syrup, coconut sugar or honey, it is still the type of thing that would be considered a treat. While this muffin in a mug doesn’t feature either flour (of any sort – nut, grain or otherwise) or sugar, it emulates a muffin. The texture is like a muffin too. It could be good to include as a snack or to have as a lighter breakfast. Whizz all ingredients except the raspberries together until well blended. Fold in the berries and place in a mug or cup. Microwave for 3-4 minutes until the centre is cooked. Serve either with a cup of tea on it’s on, with a bit of butter or nut butter, or as part of a breakfast with yoghurt, and additional berries. Really delicious. Dad loved it. I used to LOVE dips and condiments – until I started looking at ingredient lists. Too many have additional preservatives, thickeners and sugar in all forms. So I now make my own. This is delicious and really easy. Cheap too, during summer, as tomatoes are plentiful. Mix all of the ingredients together and roast in 180 degree oven for around 45 minutes. Leave to cool and then whizz together with blender, food processor or stick until smooth. Enjoy however you like. Would also be delicious heated as a tomato based sauce for panfried fish with parsley. I’m not going to say this is sugar-free therefore you can eat with reckless abandon. This is a treat – and a pretty expensive one! Not at all a regular part of a ‘whole food diet.’ However if you want to make someone something that looks like fudge, this could be good! Original recipe is here. Line a loaf or cake tin with non-stick baking paper. Melt the cacao butter (it’s white, who knew?!) and coconut oil and blend with the vanilla, honey and cashew butter either by hand or in a food processor until smooth. Top with grated chocolate. Pop in fridge to set for 2-3 hours. This is best kept in fridge or freezer. I saw two recipes last week which were almost exactly the same – both used the same ingredients to make either a loaf or a cake. 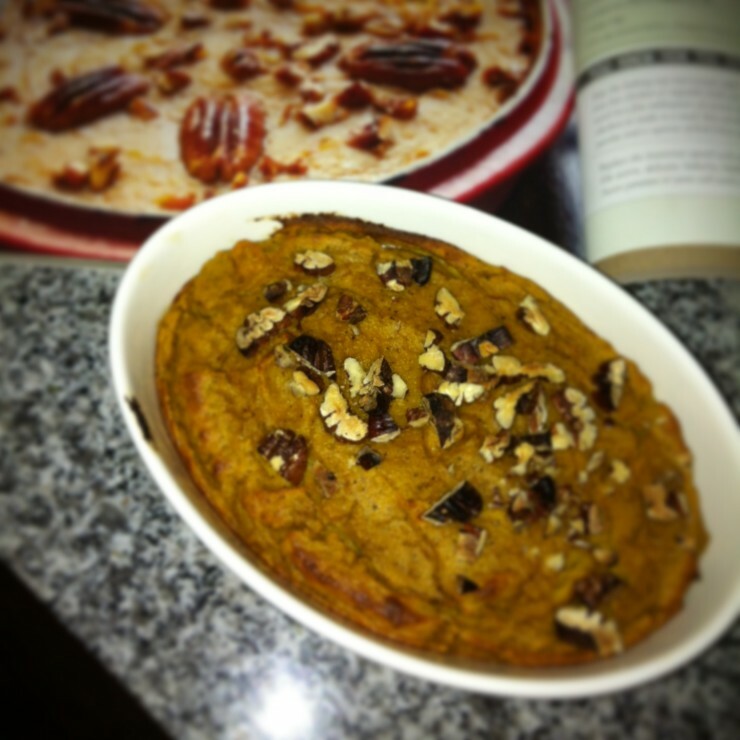 I have tried both (this was delicious, from Petite Kitchen) and thought I would use up leftover pumpkin in a modified version. It is super easy, there is no flour, and would be yummy toasted. Preheat oven to 160 degrees Celcius. Put all ingredients in a food processor and blend (or do it with an egg beater or by hand until smooth). Grease a loaf tin with butter/coconut oil and pour batter in. Cook for 30-35 minutes until skewer comes out clean. Lasts up to a week in the fridge. 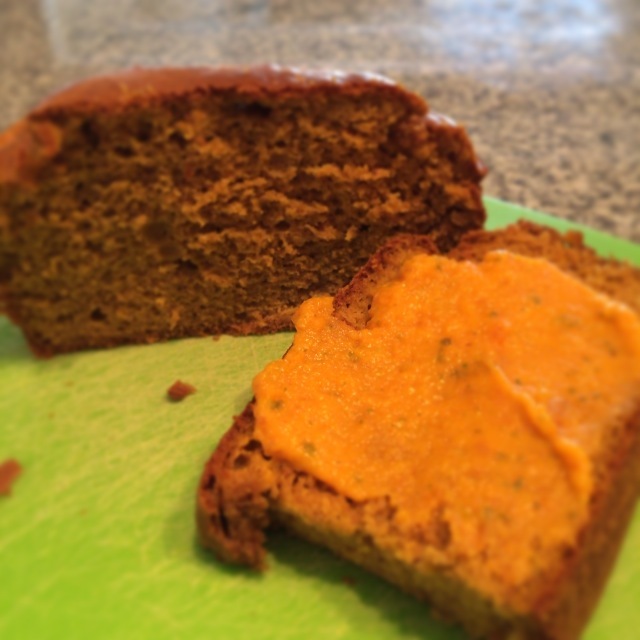 Pumpkin loaf with roast carrot and mint dip. I got inspired from Sarah Wilson’s I Quit Sugar cookbook, and made a few tweaks to her tabbouli recipe. This would be perfect on the side of the lamb meatloaf, a home-made beef burger (wrapped in lettuce) or falafel for those with vegetarian leanings. Blitz raw cauliflower in a food processor or blender until it resembles rice (or cous cous, really). Take 1 1/2 cups of this and combine with the chopped vegetables and herbs. Mix gently together. Whizz together the cumin, lemon juice and olive oil and mix in to the vegetables. Season with salt and pepper. 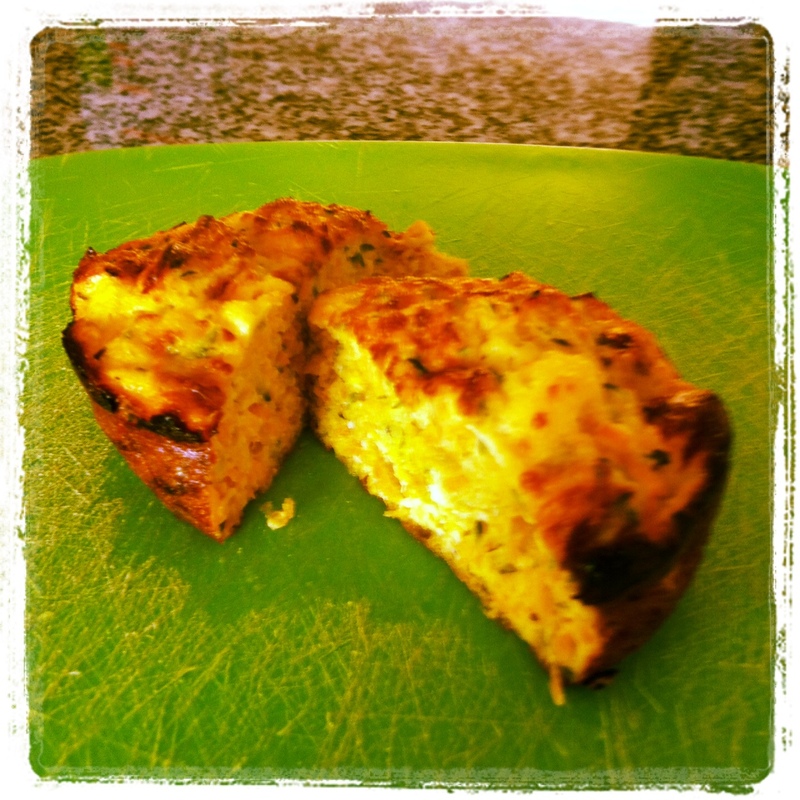 Yet another use for cauliflower…. grain free tabbouli! Fact: this is delicious. The picture is average. Preheat oven to 180 degrees C. Combine all but last three ingredients until well mixed. Then put half in loaf tin, crumble feta and sprinkle olives (mine were green w pimento added) down middle. Top with the other half of mixture and top w passata. Bake for 35-40 min. A lot of fat came out which I drained off. Was a silicon loaf tin so that was easy to do. Too average for even Instagram to save, this picture does not convey the deliciousness of this meatloaf. This recipe originally came from the Healthy Food Guide magazine, and tastes great as the original recipe; however I didn’t have time to roast vegetables, and didn’t have any on hand, so just used what I had. Not one for people who are dairy free. Preheat oven to 200 deg celsius. Grate the carrot and courgette on the fine side of your box grater and put into a bowl. 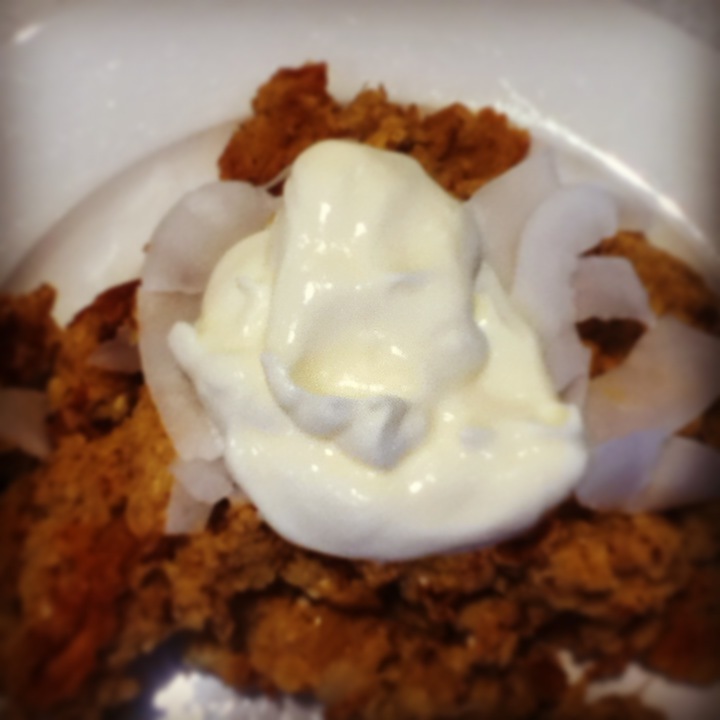 Use a food processor to whiz the cottage cheese until creamy and smooth, then add the eggs and mix until blended. Add to the vegetables and mix until … mixed. Crumble the feta cheese into the mix, add the basil and season with salt and pepper. Melt the butter or coconut oil and use to grease the 12 cup muffin pan, then add mixture. Top with grated parmesan cheese and bake in hot oven for 20-25 min until a knife comes out clean. Tasty. These would be a great snack with salmon IMHO. 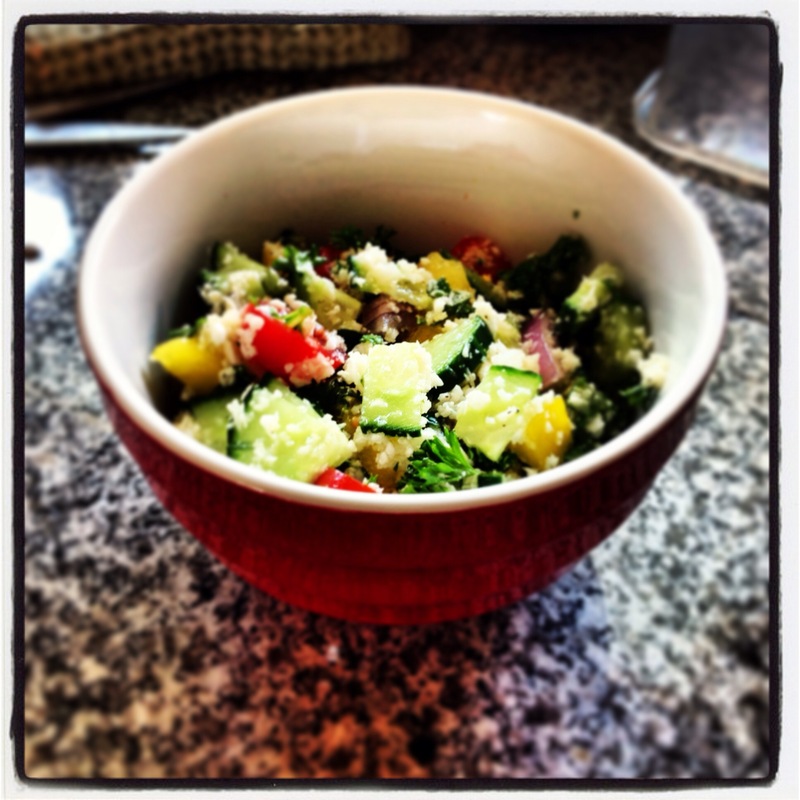 Grate courgettes and pop into a bowl. Whizz 3 eggs and coconut flour together until blended, then add to the bowl until mixed. Season with salt and pepper. Heat oil in a non-stick fry pan until melted and spoon mixture into pan. Cook until golden on each side. At the same time (if room in pan), put slices of apple and haloumi in pan and fry on each side until golden, using the oil from fritters and fat in the haloumi to cook. 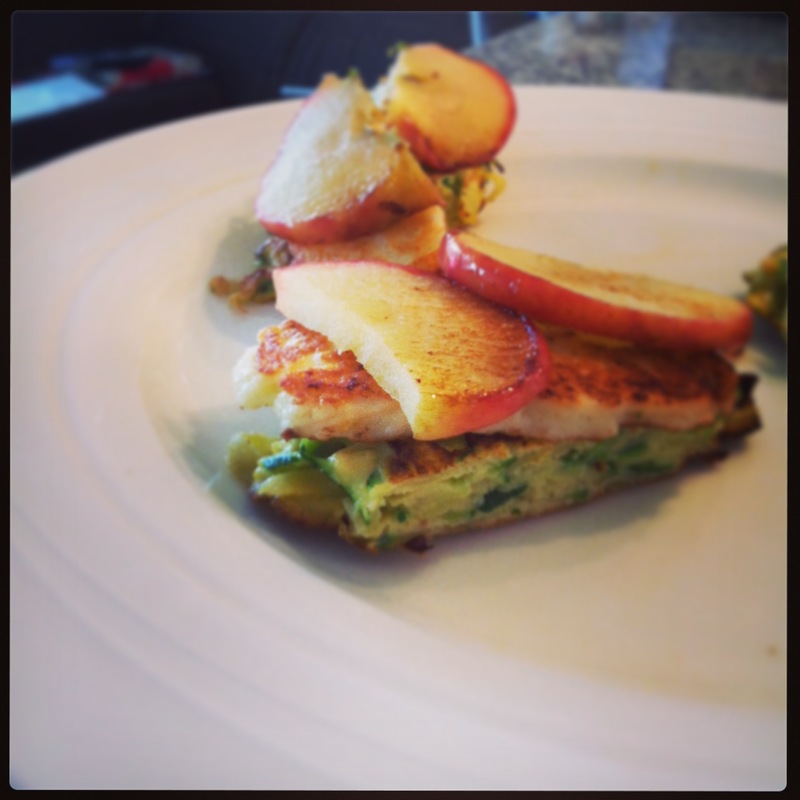 Top the fritters with haloumi and apple and enjoy. 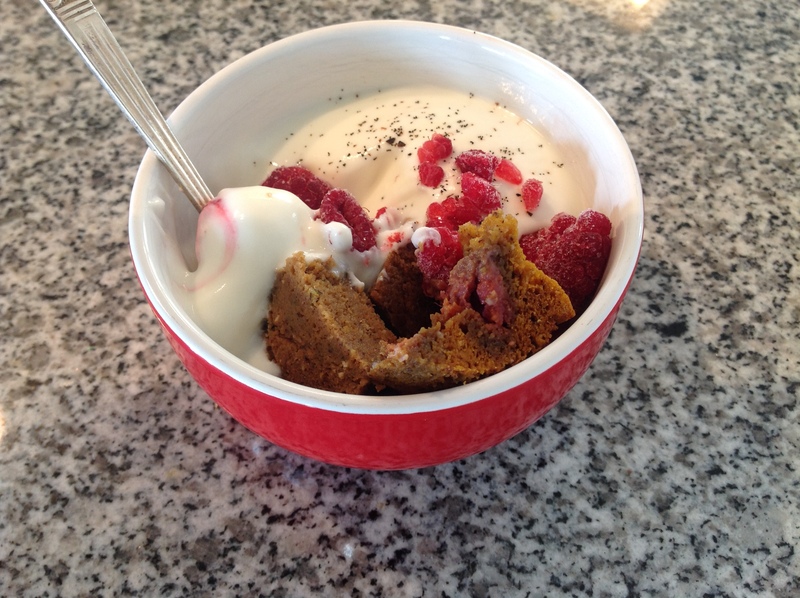 From Sarah Wilson I Quit Sugar Cookbook – putting together two recommended snacks into one delicious light meal. HK sent me a picture of her risotto that looked so delicious that I had to share. The beauty of using cauliflower instead of rice is that it takes next to NO time to prepare – no slowly stirring the pan for 20 minutes waiting for the liquid to absorb. Instead it’s easy to prepare, quick to cook, and by all accounts, delicious. Just choose your vegetables, a protein source, something to sauce it up and it’s done. Saute onion, garlic, courgette in oil/butter until onion translucent and courgette soft. Add sour cream and cream (or coconut cream) and stir through. Add the cauliflower rice, protein source and cook for a few minutes until heated through and season to taste with salt and pepper. 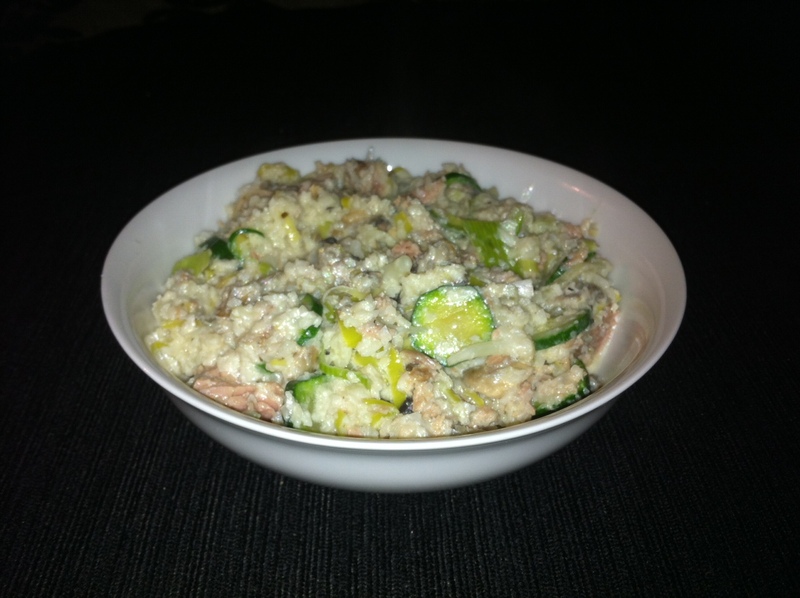 No-rice risotto for one – with can of tuna stirred through. Delicious. Once cooked – serve with coconut and greek yoghurt – I have this scramble every day for breakfast, it is super quick, tasty, and it keeps me sustained until lunch time – sometimes as late as 1.30! This keeps me going all morning and I always look forward to this breakfast. This is great for lunch on the go and so easy! Preheat oven to 180 degrees. Mix all ingredients together and pour mixture into muffin tins or loaf tin – bake until set. Nice hot or cold. Bacon and egg pie. Who needs the pastry? In a small bowl add all the dry ingredients and toss around until all dry ingredients are incorporated into each other. Then in a food processor add 3 eggs and 1 cup cooked pumpkin and mix until there are no more lumps then add coconut oil while mixing and continue to mix until thoroughly incorporated. Add water, mix then add this to the dry ingredients (make a well) and mix until completely blended. Add crushed walnuts. Pour mixture into loaf pan and spread around so it is spread out evenly in the loaf pan and place in the oven for about 55-60 min. I love eggs. And I love omelettes. In the Gold Coast (where I have recently been to for a brief visit and a run) there was a proliferation of Coffee Club type cafes right by our accommodation. Though the coffee was mediocre (it is, after all, Australia), the surprising find was that, actually, the omelettes at this cafe we ventured to for breakfast were pretty damn good. I decided to emulate their spanish on my return – and have made it a few times since. Heat oil/butter in a small frypan and (on a medium heat) pan fry the onion, olives, mushrooms and sundried tomatoes until onion is translucent and mushrooms are cooked through. Whisk the eggs in a bowl and then add to the pan to form an omelette. Once it starts to set on the bottom (but still not quite set at the top – it will bubble a little) top with the spinach and the cheese and then flip half of the omelette onto the other half to finish cooking. Yum. Not sure how Spanish this actually is, but who cares? It is a nice change from ham and tomato. Eggs are the best thing for breakfast as they are just so satisfying due to their hefty protein hit. If you find yourself getting stuck in a rut, then do something different with them. Because I was in an omelette mood, but didn’t feel like a savoury breakfast, I had a search around the internet to find a sweet option. This blueberry version totally hit the spot – and would be yummy with either almond butter, greek yoghurt, or both. Whisk the eggs, coconut milk and cinnamon together. Melt the coconut oil or butter in a small fry pan and add the egg mixture. Once it starts to bubble on top add the blueberries and the coconut flakes. Flip one half onto the other half to finish cooking the omelette. Delicious and too easy. George over at Civilized Caveman has awesome recipes, and I’m always drawing from people like him for inspiration. On Wednesday he tweeted a new one: almond and banana pudding. Genius, I thought – and like some delicious decadent breakfast as well. Moreso, it was simple, just 5 ingredients. Well I had no bananas and I couldn’t be bothered stopping in at Countdown to get any, so I used what I had and came up with this. Obviously, super easy, this is subtle, very light, yet deceptively rich. Hence why I’ve called it a mousse, and though it serves 2, they are small serves. It would also be lovely with some additional baked fruit as a cream on top – I haven’t added any additional ‘sweet’ to it as it didn’t need it. Scoop cream off the top of the coconut cream can (which is pretty much most of it if you have a can with little else than coconut in it). Whip with a whisk until light and fluffy. Set aside. 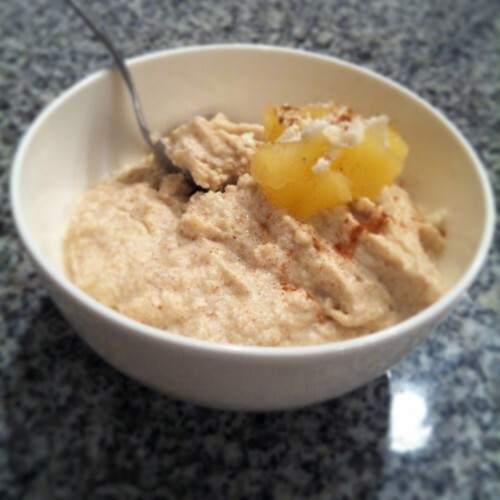 Mix apple and almond butter together in food processor until smooth. Add coconut cream and cinnamon and fold together until mixed through. Spoon into two (smallish) bowls. Garnish with whatever you think looks good. Enjoy. A light dessert, but deceptively rich. I love sardines, and they are so good for you – they have a high omega 3 content that helps with anti-inflammatory processes in the body. Their bones also contribute to calcium in our diet. And they really are just yummy. I have my Dad to thank for getting me to jump on the sardine bandwagon. Anyway, it’s the base that makes this pizza awesome, as the ground flaxseed and almond meal give it a satisfying crunch and make it feel like a wholesome good for you bite to eat. So if you don’t like sardines, then put your own topping on. Grate eggplant with cheese grater, discard skin. Place eggplant, almond meal, ground flaxseed, coconut flour, egg, salt and pepper into a mixing bowl or food processor and whizz until combined. After combining, spread out onto the baking tray until you have a thin base of around 2cm thick. Remove crust from oven, cover it with another sheet of baking paper and flip it over, peeling away the original sheet of baking paper. Bake the other side for 10-15 minutes. Bake for an additional 7-10 minutes. If you’re after something delicious and quick as an evening meal or anytime of the day, then this soup is for you. If you like blue cheese that is. You can find other recipes out there that have a load of ingredients that you think will be far more decadent. Actually, this is pretty decadent and has just three. Chop broccoli into bite sized florets and cook until tender in the stock. Chop the blue cheese and add to soup. 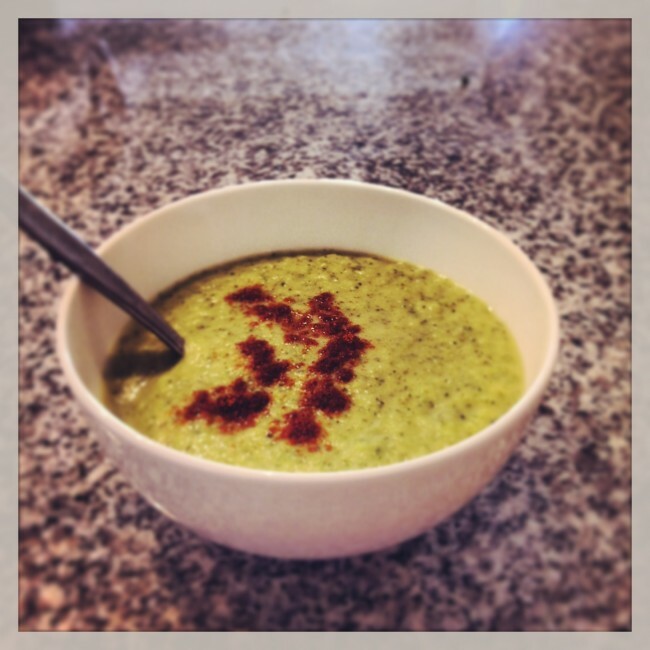 Use a blender or stick blender to whizz into a creamy soup. If you feel like it, sprinkle with paprika. Pretty. Yet another way to use cauliflower! Awesome when it is so cheap right now. If you end up using a stick blender, make sure your pot is deep enough so you don’t end up with beetroot splatters all over your kitchen, like I did. In a large pot, heat the oil and fry the onion and garlic until the onion is translucent. Add the spices and fry for a couple of minutes. Add the cauliflower and beetroot and fry for a further 2 minutes. Add the water, bring to boil and turn down, simmering for 15 or so minutes until the cauliflower and beetroot are soft. Stir through the tahini and add the salt to taste. Take off heat and use stick blender to whizz until smooth. 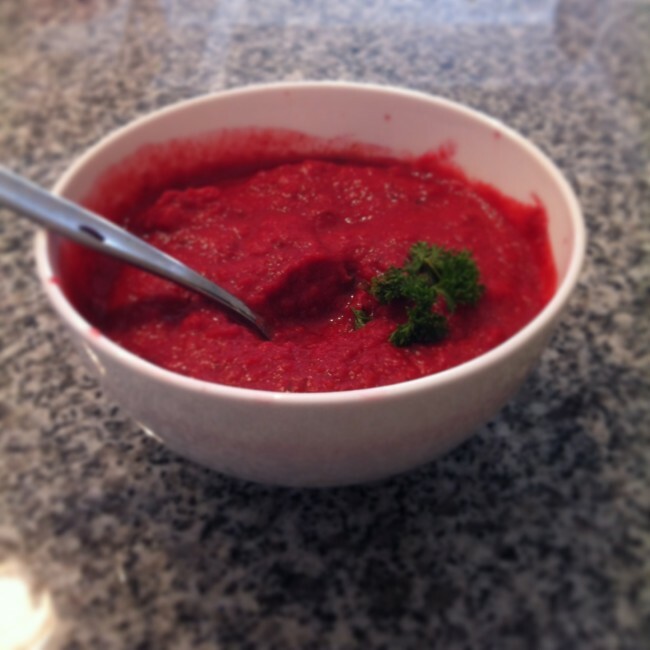 Photographer/stylist I am not, however I do make a good beetroot soup. The best thing about frittata is that it takes no time to put together. As I was making the coconut slaw (see below) I baked the bacon, and then whizzed together the eggs and grated the zucchini in about 3 minutes while waiting for the silverbeet to steam for dinner. 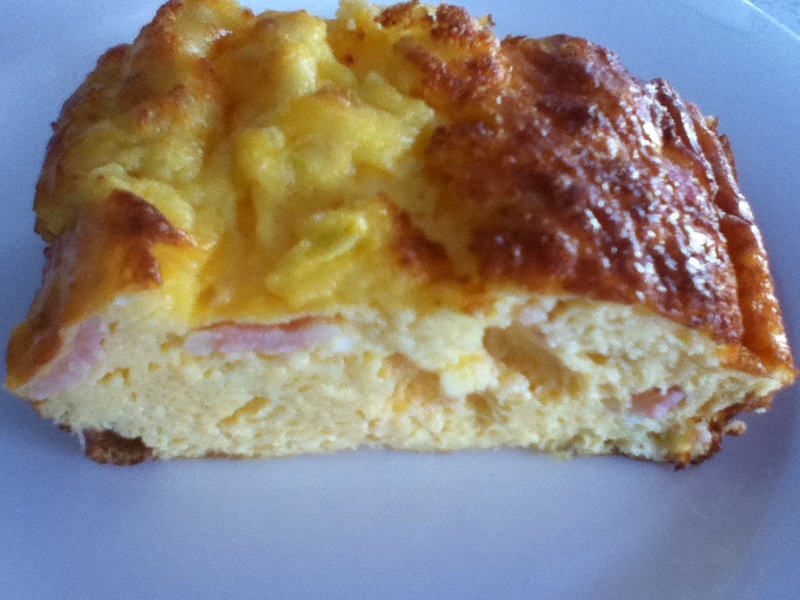 You can chuck anything into frittata; I had bacon left over from breakfast (Freedom Farm – yum! ), and a zucchini that was waiting to be used. Perfect. Enough for 3 lunches and by that stage you’ll be over it and looking for something new. Lay bacon on baking paper and tray and bake in 200 deg oven for ~12 min until cooked. Roughly chop (because you always get told to do that, right?) 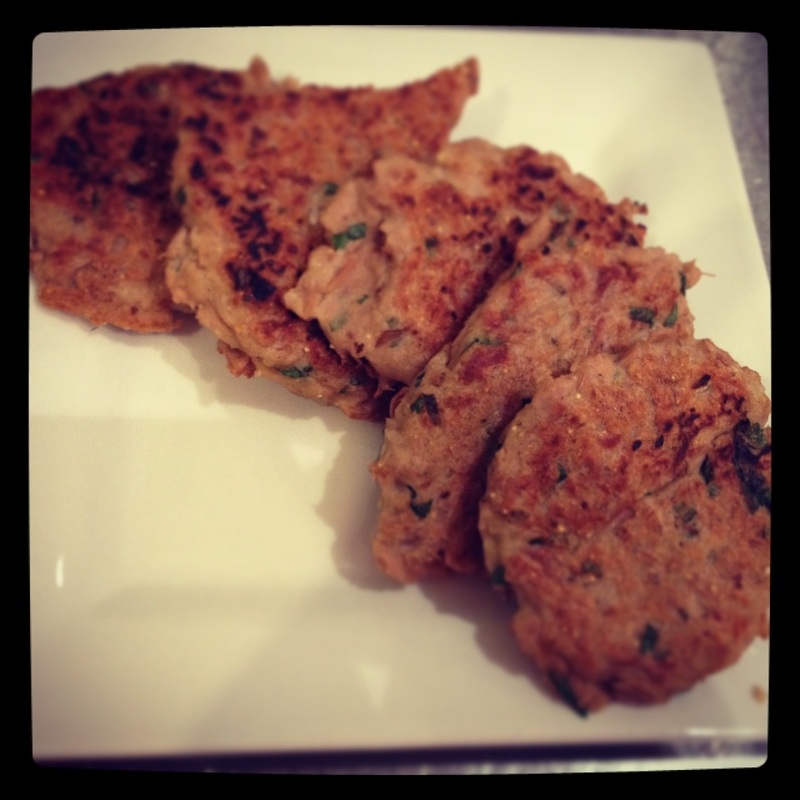 into small pieces – I put mine through the food processor briefly. Put into bowl and grate zucchini into the bowl. 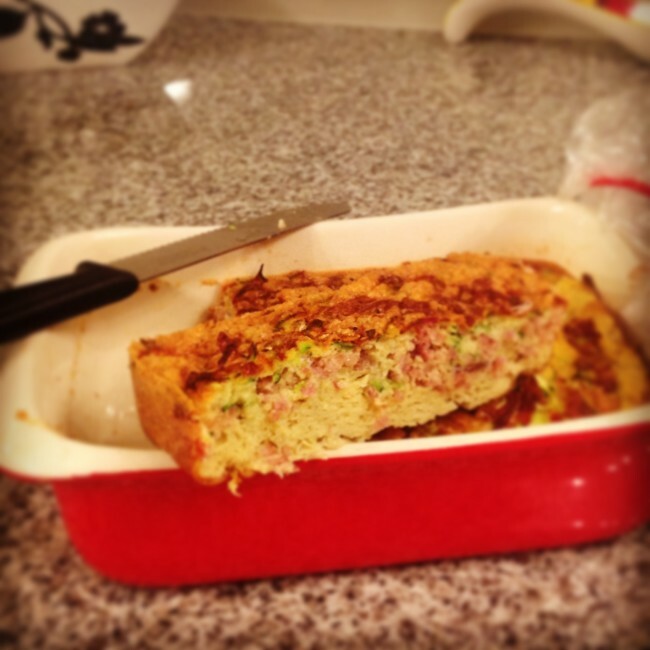 Whizz the eggs and baking soda together until mixed and fold through zucchini and the bacon. Put into a casserole-style dish and bake on 200 deg until golden on top (~25 min). 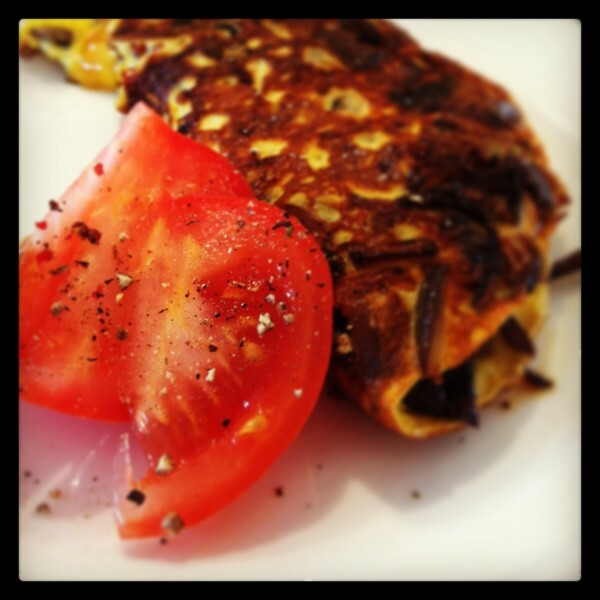 I love frittata as an easy lunch to put together for the week. Use those leftover veggies. I was searching for some new lunch salad recipes and I came across a version of this at Everyday Paleo. You’ll find loads of these recipes around, and it’s the best way to prepare for lunches during the week because it lasts a lot longer than a green salad variety. 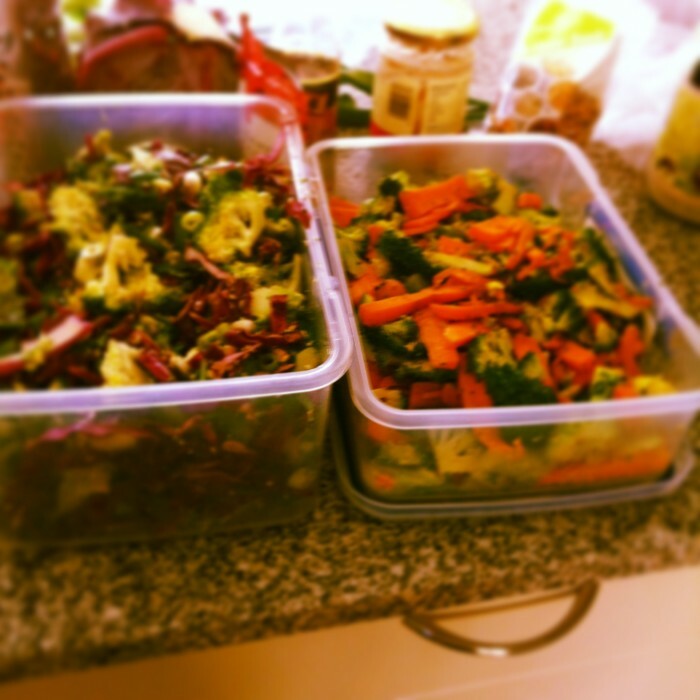 And by varying your salad up, you won’t get bored with the same old same old; because it’s different every week. Hooray! Put the first three ingredients into a bowl and gently mix. Whizz together the olive oil, lime juice, yoghurt, mustard and honey until well mixed. Add to the rest of the ingredients and mix with hands until well combined. Mix the first 4 ingredients together in a large bowl; mix the other ingredients together in a smaller bowl. Drizzle the dressing ingredients into the bowl and use your hands to mix through. The sesame flavour would be delicious with steak or with salmon. I’m a bit obsessed with using cinammon or mixed spice with vegetables at the moment. I think it’s because we’re moving into winter and there is something warming about these autumn spices. It adds a sweeter flavour, particularly with the coconut oil, and would be a nice accompaniment with … well, anything really. Chop the carrots and shred the head of broccoli. Heat the coconut oil in a pan and fry the garlic for a couple of minutes until brown. Turn the heat down, add the broccoli and the carrots and the mixed spice. Mix until combined and cover with lid to cook on medium heat for around 8 minutes until cooked but still a little crunchy. 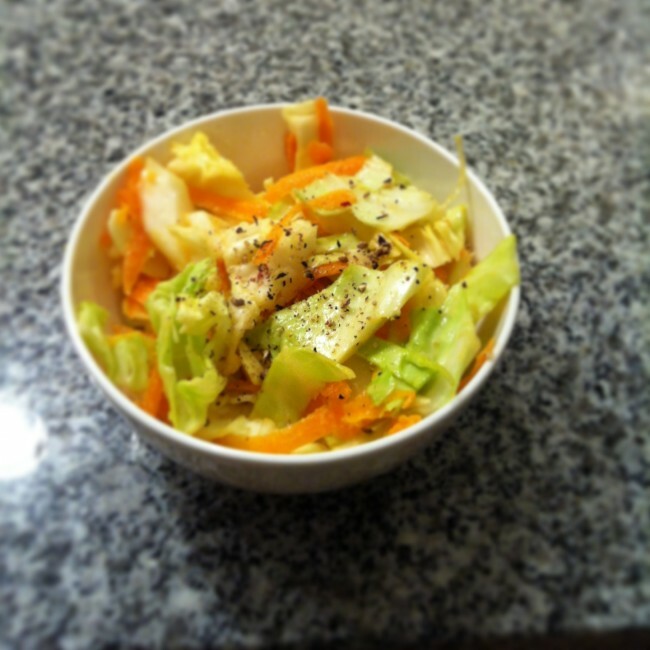 Sesame asian coleslaw (L) and Warming winter salad (R). Broccoli features in both purely be coincidence, though the flavours are entirely different. I am almost embarrassed to post this as a ‘recipe’; it’s not really. It’s an assembly of ingredients I had on hand that finished off under the grill. However, despite the ease of preparation (or perhaps because of it?) this is a warming dish to have on a cold winter night. Steam or boil cauliflower until soft on the stove top, then transfer to a food processor (or not), add butter, oregano and seasoning. Puree until smooth in processor, or with stick blender. Put the salmon in the bottom of a small casserole dish, then cover with cauliflower puree and top with grated parmesan cheese. Grill until brown. Eat yourself or share with someone. I’d have it with stirfried brussel sprouts and baked pumpkin because I like those vegetables! Obviously you can fancy this up with anything, really – and enjoy. Recipe is overstating the amount of work involved with this salmon and cauli bake. It’s too easy. Cook beetroot, skins on, until soft on the stove top. Transfer to food processor and blend until it is a puree. Add the rest of the ingredients, adding more or less salt and chilli to taste. Done. 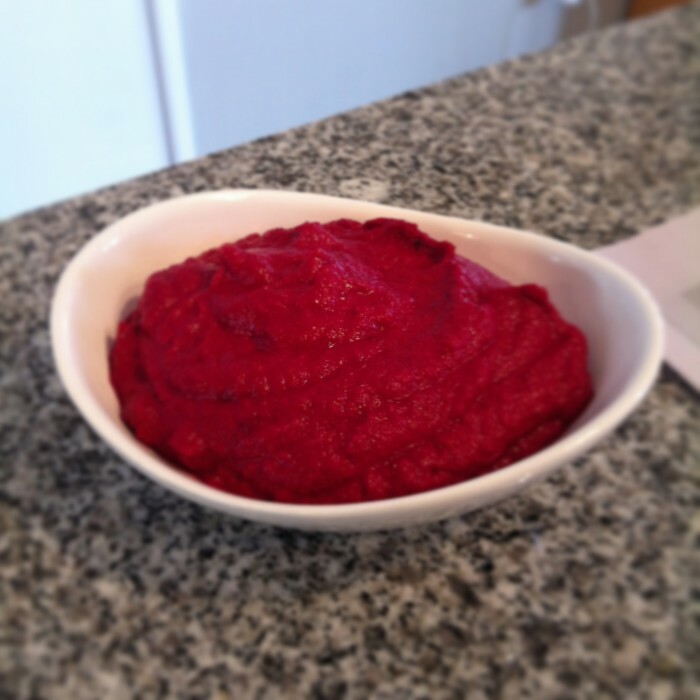 Beetroot hummus, was so delicious with venison sausages. So, I’m not the biggest cupcake fan out there, as typically they are a massive sugar bomb, with nothing good in them. And, controversial I know, but by sugar I mean sugar, maple syrup, palm sugar, coconut sugar, 500g date puree… etc. But with an abundance of beetroot I wanted to make something different for Scott, Matt and Bre who were coming around for lunch. 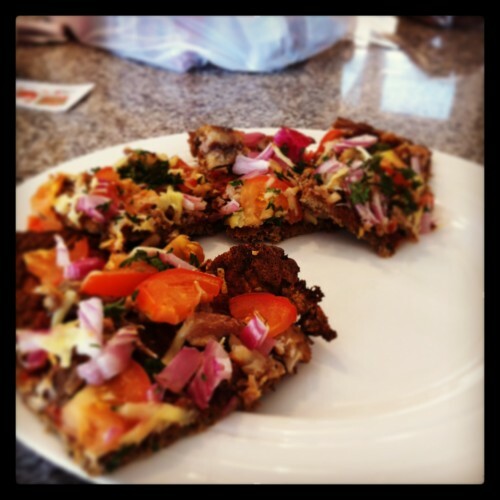 After searching the net for recipes, I finally came across this one from the Healthy Chef. I modified it slightly, based on the available ingredients. As I further reduced the sweetener in it, the cupcake itself is not sweet AT ALL. A taste test by Scott revealed that, if you are looking for a sweet treat, this isn’t it. 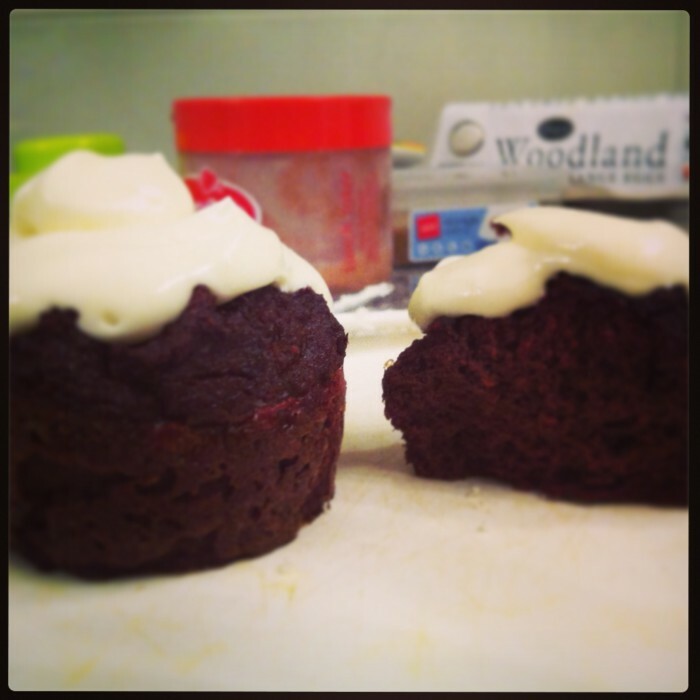 However, adding the cream cheese icing adds a hint of sweetness, and overall there is a depth of flavour that isn’t overpowered with ‘sweet.’ For people who have adjusted to less sweet food, you will enjoy the texture and flavour of these cupcakes. But then, I might just be biased. Combine the ingredients and wait until it hardens slightly before icing. Red velvet cupcakes. Beautiful depth of flavour, not cloyingly sweet. Is there anything that cauliflower can’t do? Probably. But one day someone, in their infinite wisdom, discovered that cauliflower was more than a white, bland version of broccoli and a bit gross if eaten cold. Its real purpose was to be the go-to substitute of starchy ingredients in dishes that adorn dinner plates across the Western world. Cauliflower really is Nature’s gift to low carbers everywhere. 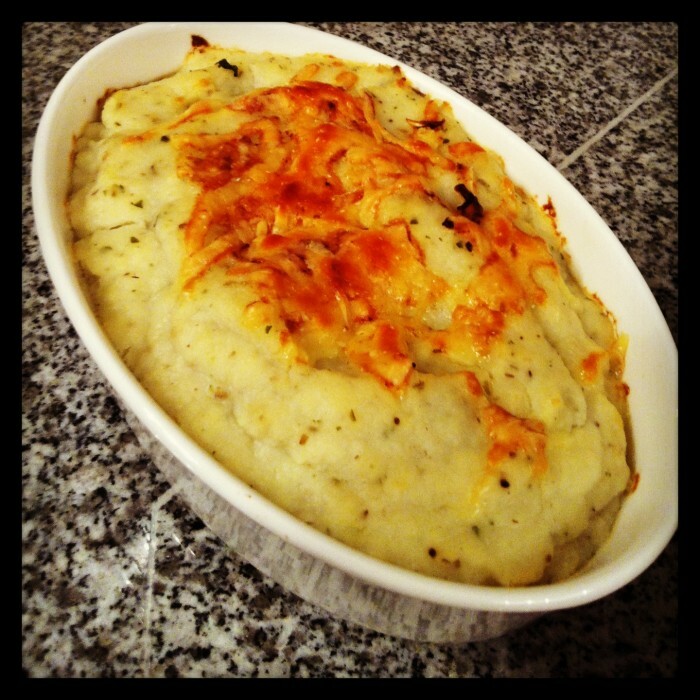 The most obvious use of cauliflower (well, obvious to those of us who have tried it) is as a potato substitute in mash. Steamed for 15 or so minutes until soft, then pureed or stick blended with butter, olive oil and some seasoning (chilli, herbs, mustard, seasoning), mashed potato it is not. It is way better than that. 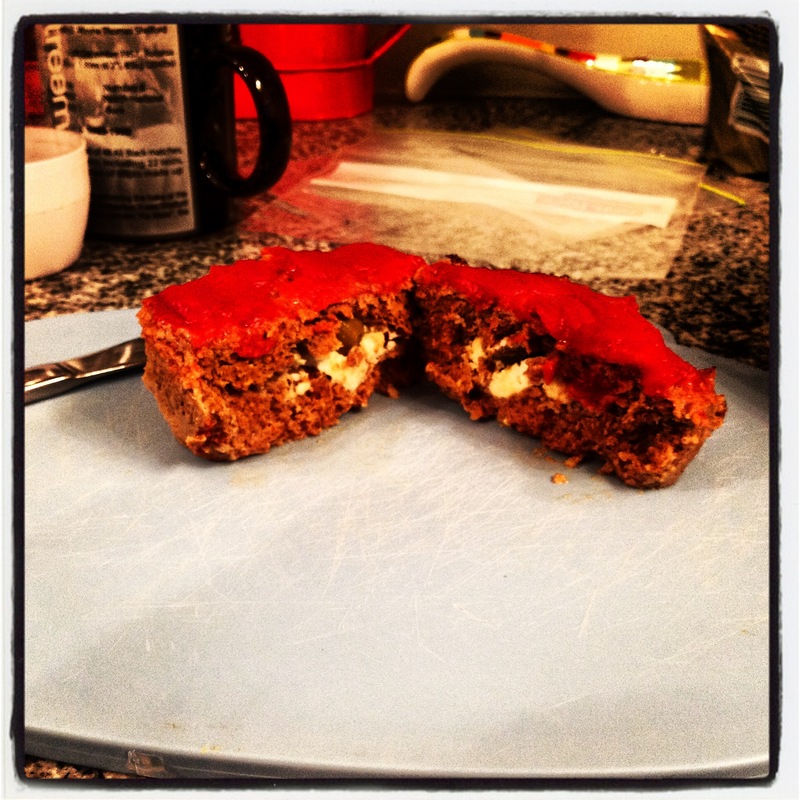 And, what is cooler, is the name Diane gave it in her book Practical Paleo: faux-tato. Love it. Love saying it. You’ll see versions of this everywhere, and it’s not rocket science to figure out how to make it yourself. 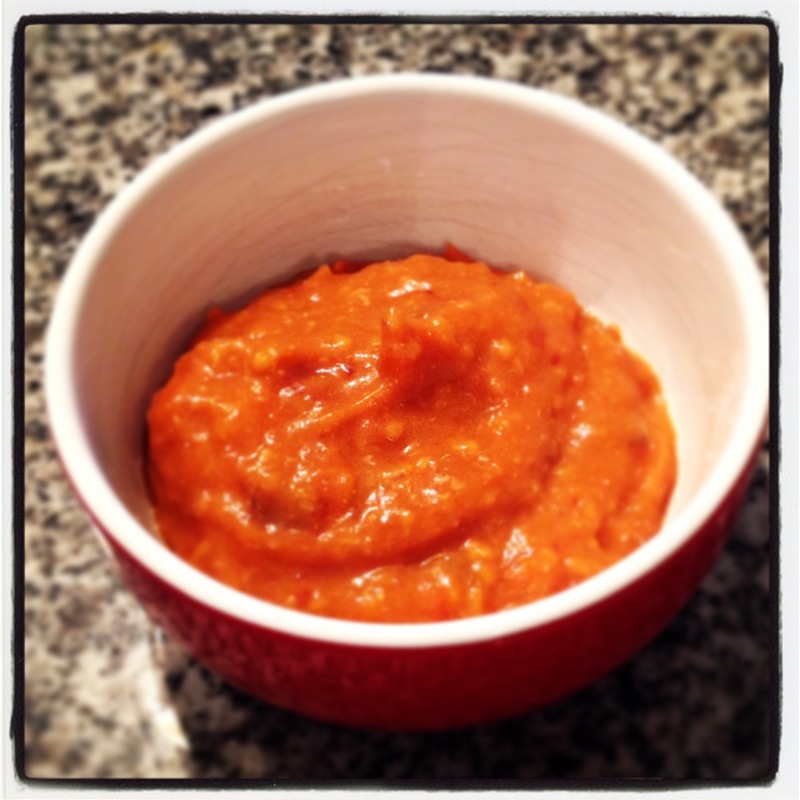 Puree in a food processor until a batter-like consistency. Oil a non-stick muffin pan and pour into pan until 3/4 full. Bake at 180 degrees for 35-40 minutes. Delicious. Take for lunch. And, finally, I came across about 20 recipes for ‘grain free porridge’ using… yep… cauliflower. Despite being a bit perplexed as to how anyone came up with this, I had to try it. Rice the cauliflower in a food processor until crumb-like consistency. Put the cauliflower with all of the other ingredients into a pot and stir continuously over a low-medium heat until thick and cooked through. Amazingly it looks JUST like porridge. How does it taste? Hmmm.. well there are definitely better grain-free porridges out there. I’d say it’s about a 6.5/10. Try it though. I dare you. 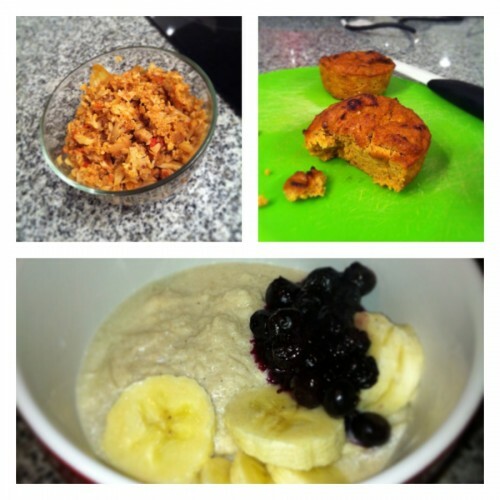 Mexican rice (top left); Mini Mexican frittata (top right); and cauliflower masquerading as porridge (bottom). It’s Autumn and pumpkin is dirt cheap. 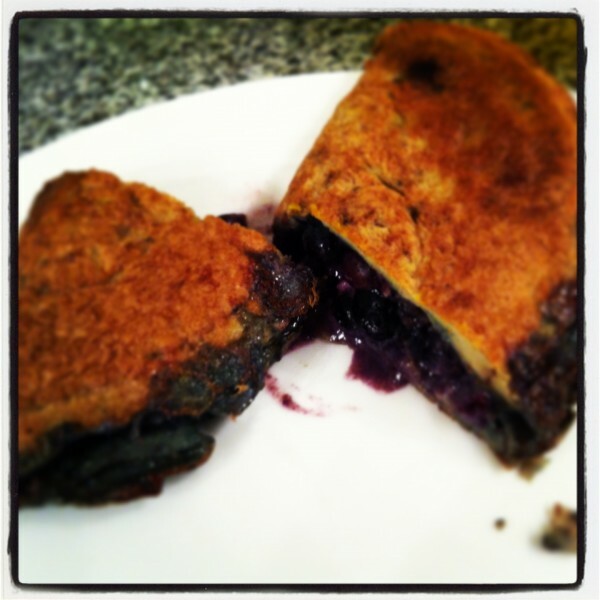 I found this yummy dish in the Well Fed cookbook, and adapted it to make this more of a dessert type dish. It is actually really nice with blueberries, yoghurt and coconut. Whizz all but the pecan nuts in a food processor until smooth. Pop in a smallish casserole dish, top with the pecan nuts and bake in oven for around 30-35 minutes at 180 degrees. An amazing likeness to the picture in Well Fed. I was stoked. 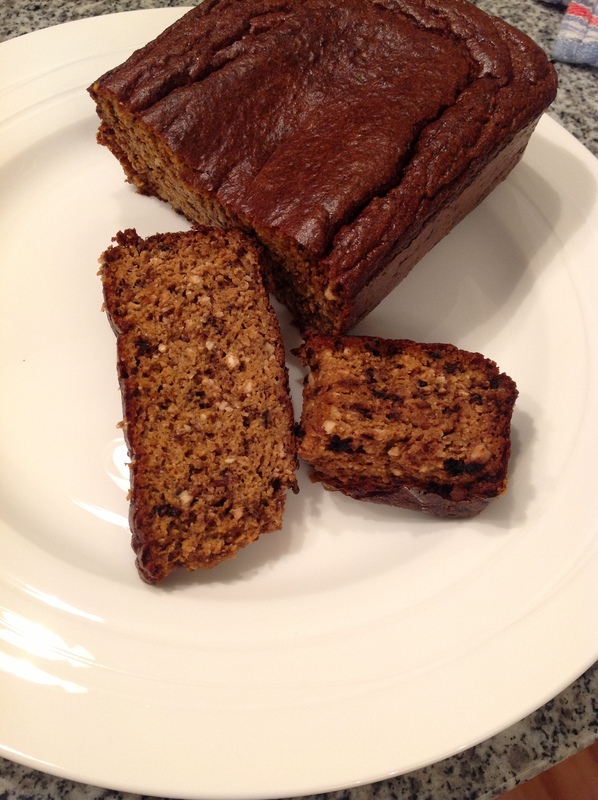 I am not a big proponent of baked goods, but for people with high energy needs (through either work or training), a loaf that is quick to prepare and can be eaten as a snack when they are on the go is really useful. I train first thing in the morning, and before long runs I like having a slice with almond butter before I head out. I’ve adapted this one from others I have seen, and try where I can to reduce the sugar without compromising on taste. I reckon I totally succeed with this one. And it rises too! Bonus. Preheat the oven to 180 degrees. Mix in food processor (or with stick blender) the wet ingredients. Add the dry ingredients. Whizz until well blended (but not, you know, over blended). Stick into a greased loaf tin and bake for 35-40 min until skewer or knife comes out clean (i.e. it is cooked). (You probably should sift the dry ingredients and fold gently though the wet ingredients. I didn’t). On reflection, sifting could increase the height of this loaf. At any rate: a good size, a delicious vehicle for your favourite spreads. 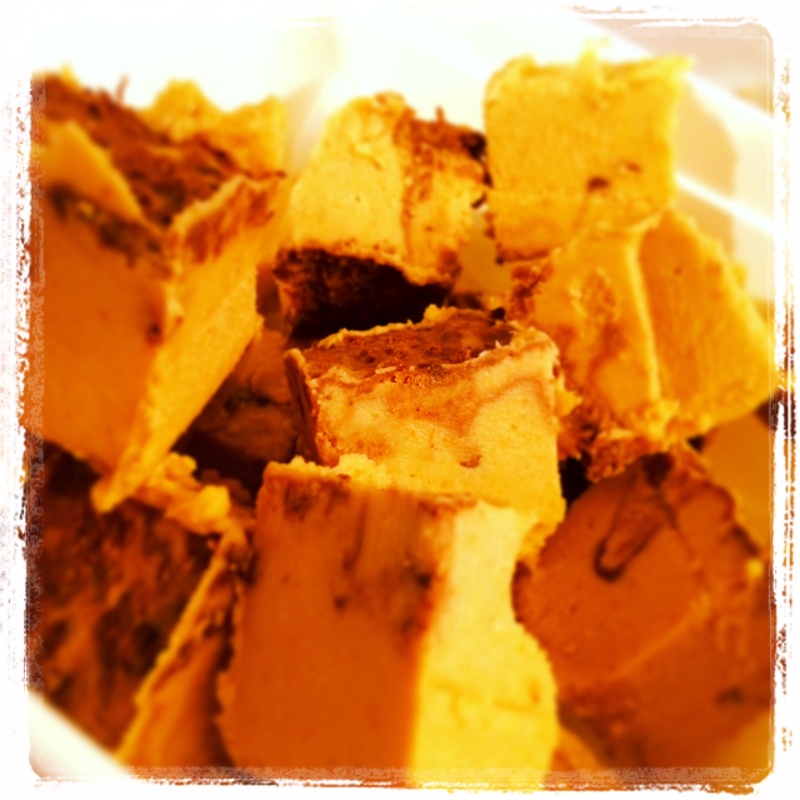 Whizz in a food processor or use a stick blender. Cook in non-stick frypan until golden. While you don’t need to add additional oil cook as the oil in the tuna is enough, you could cook in a little olive or coconut oil. Oh so glad that you enjoyed it Julie! I have also made this as muffins too… just as handy to pop in the freezer. Had one this morning before my run with some butter. Yummy. 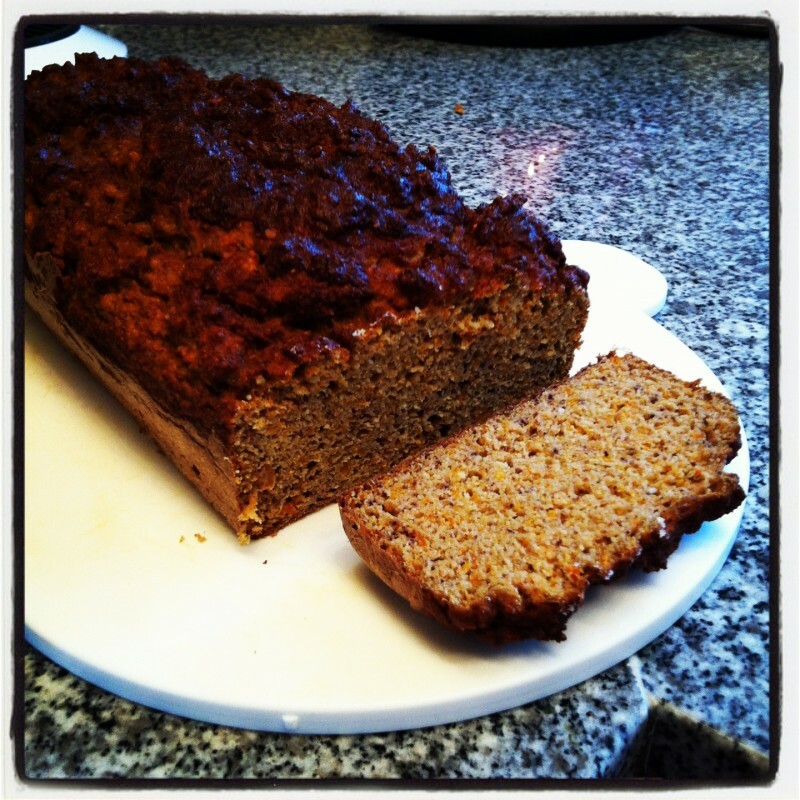 Hey mikki, the loaf is great, lovely warmed with a dollop of Greek yogurt as well! Nice to have after a big session training. Hi, I agree, ditch the scales. My dietary changes since our consultation have had massive results, more energy, stronger in training, less tummy issues, no painful periods…still snacking, (but on good stuff, nuts, greek yogurt etc) but thats 20hrs or more a week training. But the scales show nothing, the same, somedays even heavier. But the quality of food has improved alongside performance measures, so who cares about a number on the scales.